One of the more interesting side effects of the constant fluctuations in taste and fashion in relation to the antiques trade is the emergence (and subsequent disappearance) of antiques departments in some slightly unexpected places. 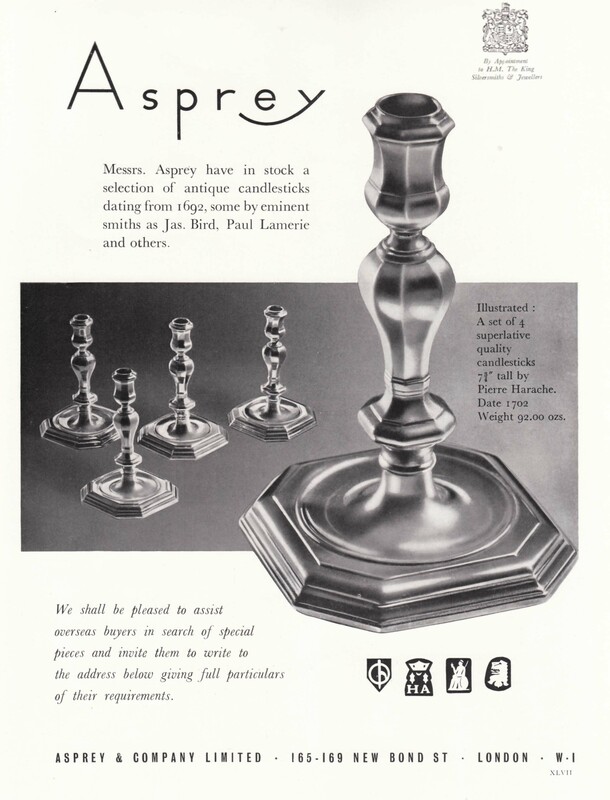 Those of you who have been collectors/connoisseurs/enthusiasts for some time will not need to be told that Asprey and Harrods were once very serious players on the London antiques scene. 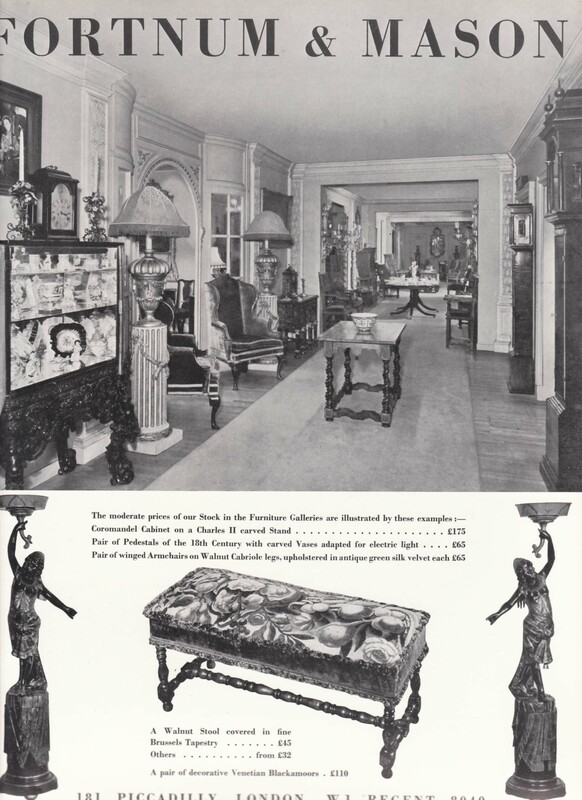 Both firms were members of the BADA (British Antiques Dealers Association) and exhibited at the celebrated Grosvenor House fair every year. They carried extensive stocks of furniture, textiles, silver, jewellery and porcelain etc. and traded at the very top of the market. Both firms had always been associated with luxury goods of course but neither were founded as antiques dealerships as such. 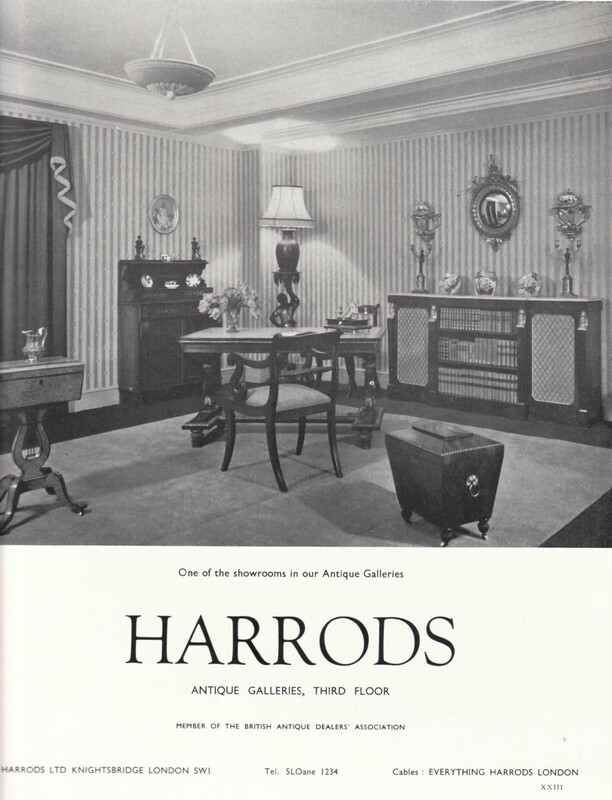 Harrods does still have a small antiques section in its store but, as this image from 1951 shows, at one stage the department was very extensive indeed. Asprey’s antiques department was the starting point for many celebrated dealers including silver specialist, and Antiques Roadshow expert, Alastair Dickenson who worked there between 1983 and 1996. Sadly the department is no longer operational though the firm does still retail antiquarian books. The image below is from an advert published in 1951. More surprising still are the following two firms that also had antiques departments in the past. Firstly Debenham and Freebody (yes, that Debenham’s). I bow to the greater experience of others but until I saw this advert from the Connoisseur in 1916 I had no idea that they had ever sold antiques. 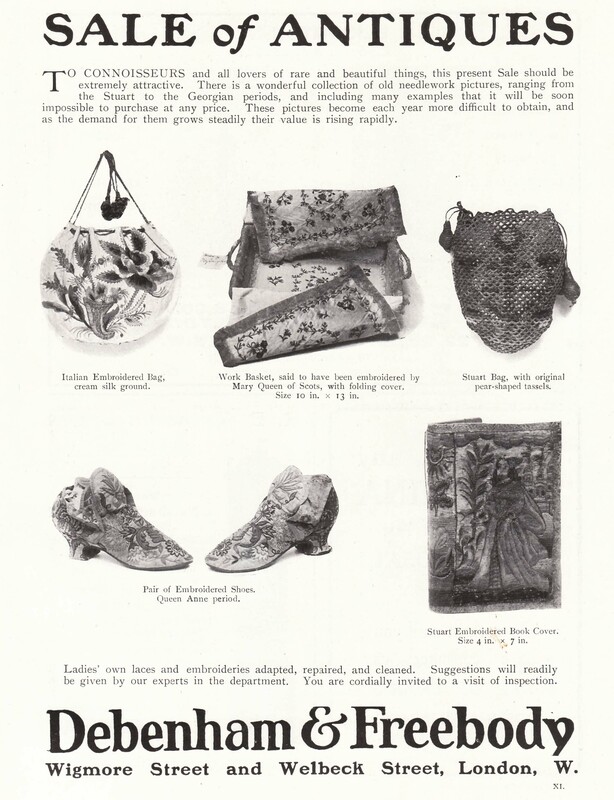 The advert below suggests that the antiques department was limited to textiles but what textiles! Some incredible examples of needlework including one piece possibly worked by Mary, Queen of Scots. Debenham’s flagship store straddling Wigmore Street and Oxford Street is still in place of course but unfortunately the collection of needlework is not. Finally we come to one of the country’s most prestigious retailers but one that I certainly wouldn’t associate with antiques. Fortnum and Mason has long been a foodie’s destination but, apparently, in the post-war period (this advert is from 1951 once again) you could also expect to see a fine selection of antiques. What I find particularly interesting about this advert is that the firm is taking a noticeably different approach to those illustrated above by concentrating on “moderate prices” as the primary selling point. That having been said, the beautifully laid-out gallery setting certainly leaves the viewer in no doubt that, however “moderate” the prices may have been, there are objects of real quality on sale here. AHRC antique dealer archives Antique Furniture Antiques Trade Gazette archives ATG BADA BADA Voices Blairman Brotherton Special Collections C Charles Chris Coles Chris Jussel dealer catalogues dealers Dealer shop interiors Dealer shops Duveen Frank Partridge Grosvenor House Images of Shops Interactive Website Jerome Phillips M. Harris & Sons Mark Dodgson Metropolitan Museum New York Oral History Oral History Interviews Partridge Phillips of Hitchin portobello road Project Conference Project Volunteers Quinneys R A Lee Robin Butler Roger Warner SOLD! Stair and Andrew Temple Newsam House The Bowes Museum The V&A Thomas Rohan Where is it Now? 'Museum Studies Now?' is an event which aims to discuss and debate museum and heritage studies education provision.